Kobe Bryant doesn’t like losing. He’s also probably the first person on Twitter to use #blackout when referring to his professional livelihood. This is just two years removed from what looked like a surefire title contender — the collective NBA fan base shuddered at the thought of Kobe and Pau Gasol being joined by Steve Nash and Dwight Howard. Lakers blog Silver Screen and Roll described it as not “just a home run for the Lakers — it’s a grand slam. In the World Series. Against the New York Yankees. Essentially, they’ve put together, on paper, one of the greatest starting line-ups ever assembled” [emphasis theirs]. The last time the Lakers were this bad, Kobe was laboring with Kwame Brown and Smush Parker, complaining to anyone who would listen that he was on his way out the door. Of course, that was before Brown (and the draft rights to Marc Gasol) were sent to the Memphis Grizzlies and Kobe won two more championships. Bryant previously took heat from fans and experts alike when he signed a two-year contract extension for $48 million, which is large enough that it could affect the Los Angeles team’s ability to dole out the big money it will take in order for the Lakers to become contenders once again. 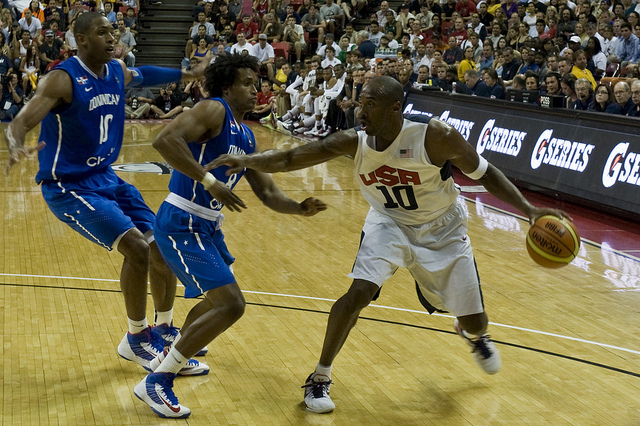 Kobe Bryant’s been in the game a long time, and he has established friendships and connections all across the league, from former greats to All-Stars that keep getting better, and at least some of this offseason is going to see the Black Mamba reaching out to the impending free agents and testing the waters on how they feel about Forum purple and gold. Its almost certainly already started. Even if the free agency pool is relatively thin (aside from Carmelo Anthony, who even Oscar Robertson thinks should get the hell out of New York), Kobe wants immediate help. It’s too bad that the salary cap is going to get in the way. The Lakers will almost assuredly try to trade their No. 1 draft pick for an unhappy superstar with Southern California roots (Kevin Love), but the only way that trade will feasibly happen is if Love lets the Timberwolves know, in no uncertain terms, that he’s not resigning with them. Other than that, prospects look slim, and while Bryant may not like a rebuild, he probably has no choice.